Mr. Banda says among the lies that have been told was that Zambia was losing state-owned enterprises and other national assets to her debtors. He said Zambia’s economy was positive and undergoing a normal economic process. Mr. Banda said the lies about Zambia’s economic situation should be brought to an end as they were capable of destroying the country’s image abroad. He expressed confidence that President Edgar Lungu has a group of professionals who would help him develop the country. Mr. Banda said that the country was capable of paying back its debt as it was within its limits, adding that Zambia had so far never defaulted on any of its loans. And Mr. Banda says Zambia should understand reasons why there are few tourists that visit the country despite being endowed with immense tourist, heritage and wildlife sites. He said the low number of tourist visitations that the country has continued to record must be interrogated in order to make the tourism sector more vibrant. 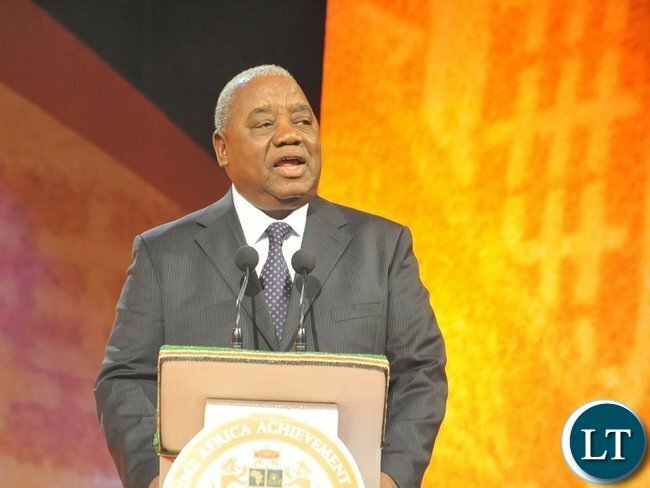 Meanwhile, His Excellency Mr. Rupiah Banda has called on African countries to give support to the people of Democratic of Congo (DRC) in order to maintain peace in that country. Mr. Banda said the DRC achieved remarkable progress in consolidating democratic transition of power despite some logistical and geographical challenges. He noted that the country now had an opportunity to tackle some of the problems it had faced in the past. Mr. Banda has since called on President Felix Tshisekedi together with his former close competitor Mr. Martin Fayulu and former President Joseph Kabila to devise a system that would help the country find solutions to its common problems. Mr. Banda was speaking in Johannesburg, South Africa, in transit to Nigeria where he would be leading a team of observers to monitor that country’s Presidential and Parliamentary elections due on 16th February. When a crook like RB is defending you then just know you are in problems!! I never seen Thabo Mbeki, Benjamin Mkapa, Sam Nujoma, Joachim Chissano, monitoring elections. Some of you kids don’t even who they are because your social studies is on social media. It’s an observation I’ve noticed among Zambians: As long as things are ok with you, then you start proclaiming that the economy is doing great & you support the mediocre Lungu & PF. RB just received a huuuuge mansion (ahead of KK, FTJ’s, Mwanawasa’s & Sata’s famlies) from PF govt, he’s globe-trotting on govt expense & receives a salary, guards, a private secretary, cars from Govt. He’s not the best person to comment on the state of the economy. Ask an unemployed youth from Chawama or Nchelenge, he’ll give you an accurate picture. Just keep quiet, it’s your season to eat. One day the season will change & the truth will come out on how you surpassed all former presidents in getting that mansion & it’ll be time to dance pelete at the courts. RB jumped the queue to receive his retirement package madam Maureen Mwanawasa still on the waiting list. Whatelse can he say because the economy in his pocket is good. Wako ni Wako worked well to pay him when thousasnd retiries cannot even get K500. RB must shut up and eat quietly as he is the godfather of corruption in Zambia hence his humilating defeat from Sata in 2011 which made him cry like a baby. It’s always sad to see an old man that has no wisdom and is driven only by greed. Plunderers like this scum bag should just shut up. They are insulated from all the economic hardships we are enduring with the loot they have. May your soul suffer in hell when you die. Bwana R B, people scan Zambia like any other country on phone and check facts for themselves. Zambia is a great country. Problems have arisen due to multiparty politics. There are people determined to ruin the country’s image to get foreign assistance to win elections. There is now a large dissident group abroad, which is the main problem for Zambia. This group generate s the vast unfavourable commentary. The group is well financed by investor groups and self interest groups all vying for influence in the country. The government needs to be very assertive in ruling and not be too frightend to control negative elements in the country and abroad. The other problem is aid, investment bodies interfering in our politics because Zambia is largely dependent on aid to manage its economy. If the country’s economy grows and becomes autonomous there will be less effect felt from the negative and false fake news flying around. Lastly, the unpatriotic citizens abroad who are largely seen as more educated and therefore superior to home politicians and the ordinary Zambian citizen are s huge problem. Most of them initially educated on Zambian educational grants at universities abroad. Apathy and lack of trust in the country’s ability to provide Western standard lifestyle is causing the problems in image. Mr Rb you are talking like that because you are benefitting from the proceeds of corruption, you were a president for 3 years and you now one of the richest men in Africa, on top of that your friend built you a house that you don’t deserve, you are greedy and shameless, you are not entitled to a free govt house when you were voted out of power, you didn’t resign! when a new regime comes into power , we will take that house and turn into into a children’s hospital. you dirty old man! Knowkege is power. You can criticize RB. That’s fair enough. But RB is entitled to a house paid by the government. He served as a president and the constitution rightfully defends him to have it paid by GRZ. What law would you use to grab the House from RB? Sata built himself a house while in power. He did not wait to come out of retirement. He forced the government to release the House funds. When statesmen such as RB speaks,losers such as Kainde should listen very carefully and stops tarnishing Zambia’s image abroad!!! The biggest problem Zambia has had since 2006 is HH.Kainde is worse than poverty or HIV!! !Cursed is the day that man(Kainde) was born.His desperation for state house has caused much harm than good to our economy!! !IN 2021,WE MUST ALL TEAM UP ESPECAILLY IN 6.5 PROVINCES AND RETIRE HH FROM LOCAL POLITICS SO THAT THERE CAN BE FRESH AIR IN OUR POLITICAL ARENA AFTER 2021! !well said RB!! This is the problem we have with such egotistical fools like this man with no wisdom to impart. Oh yes when you have a government that builds you a mansion at the expense of the suffering majority, you certainly have the audacity to spew such nonsense. You are completely irrelevant and immoral, go away twanaka. You must be extremely unwell to say Zambias economy is okay. I feel sorry for the man. The best we Can do is forgive the man. Ignorance and lies being advanced by RB is very worrying. Not all of us are in the opposition, there are some neutral people like me who get saddened by such comments from a former President. Can someone take him in compounds and villages and later bring him back to comment. Rupiah BweMansion Banda ,you’re deluded seriously . When you left the economy was expanding at 6.3% and debts were low but now growth has lagged at 3% for almost a decade plus IMF warnings and Fitch downgrades .THAT’S BLEAK surely Bwezani Banda. Zambia is in an economic crisis, but obviously things are very good for the 1% of our population which includes RB and his children. Its shocking that of 27,000 teacher application less than 9% are accepted! Close to 100,000 qualified teachers are on the streets MTN,Airtel,Zamtel,Zoona money booths scratching for a living or in backstreet schools earning a paltry K1,000 or below..the economy is doing well? IF YOU ARE UPND COMMENTING RAISE YOUR HITLER HAND. RB is a great ambassador, period. Imagine if your HH did the same our country would be better. I think if HH believed he could be Zambia’s next president he would react better. He is very doubtful of his presidency. The barking of a confortable man.